Pizza-style omelettes are my new favourite way to start the day! 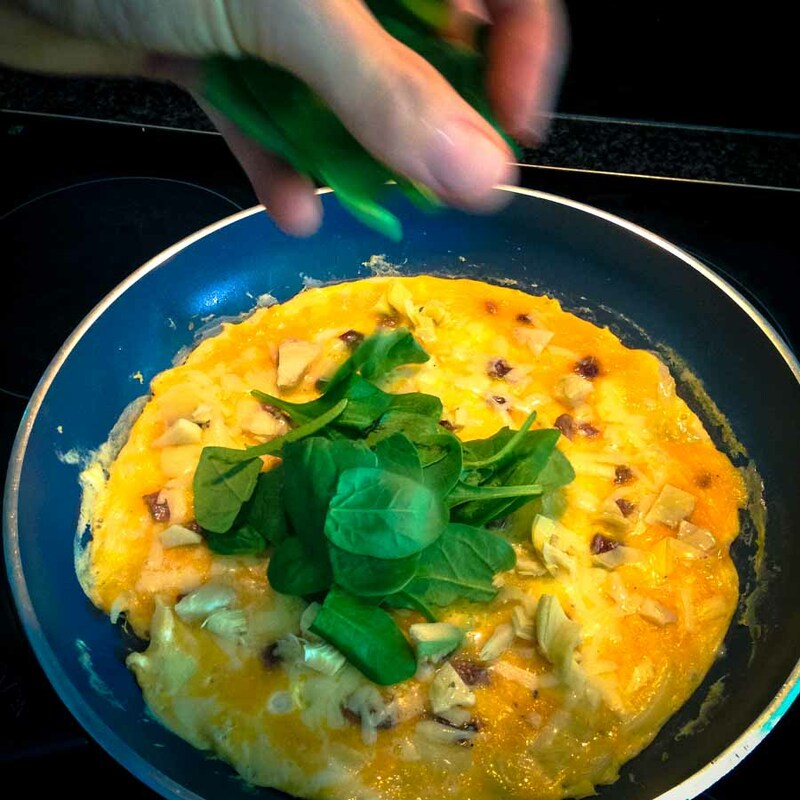 This omelette recipe takes away the monotony of eating plain old eggs every day, and instead you will really look forward to chowing down on this breakfast treat. 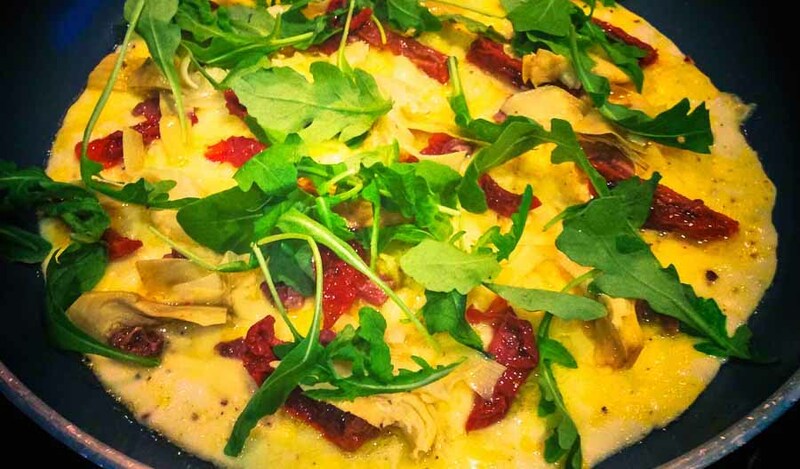 The reason this is called a pizza-style omelette is because you would usually find these toppings scattered over a gourmet pizza. You can also have fun experimenting with the toppings – this recipe is just the beginning! Other combos you should try are low-fat mozzarella & cherry tomatoes, or goats cheese & fried red onion and capers. 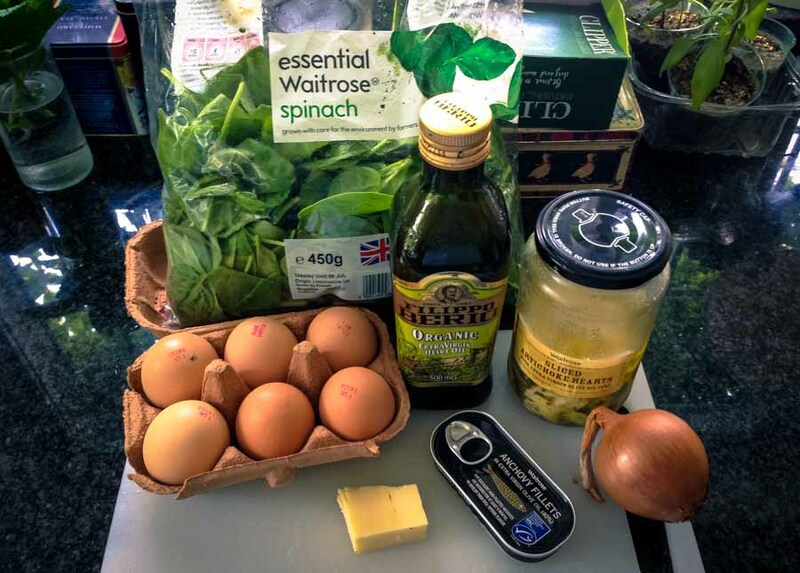 This particular recipe is perfect for anyone following a high-fat low-carb diet, although you can also have a bowl of oats on the side if you need some carbs to hit your macros. Don’t be put off by the cholesterol content of the egg yolks. Cholesterol is actually used by your body to produce testosterone, so you need it in your diet, especially if you lift weights. Contrary to popular belief, cholesterol in foods has a minimal effect on bad LDL cholesterol levels in the body. Peel the onion, cut it in half and slice up one of these halves. 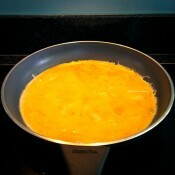 Place a large frying pan over a medium to high heat. Open the tin of anchovies and pour the olive oil from the tin into the frying pan (about 3/4 of a tablespoon). Chuck in the sliced onion and fry until it turns clear. Meanwhile, crack the eggs into a container (a large measuring jug works well) and whisk them with a fork to mix the yolks and whites. 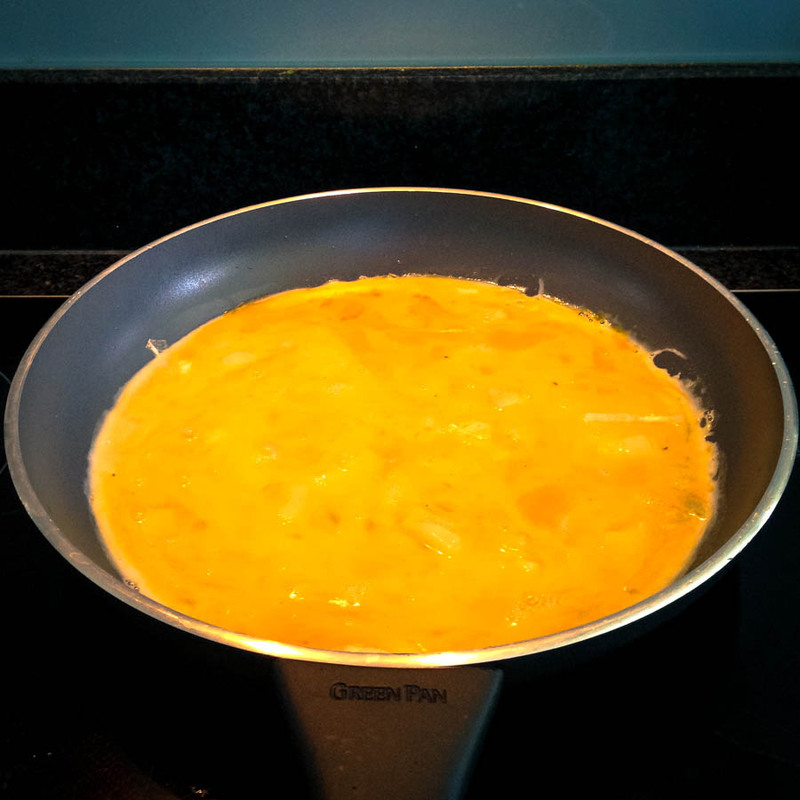 Make sure the oil is evenly coating the bottom of the pan (use a spatula to spread it around if needed), and then pour the eggs into the frying pan. 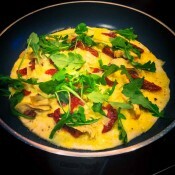 Whilst the eggs are cooking, finely chop the anchovy fillets, and slice the sun dried tomatoes and artichoke hearts. When the omelette is nearly set (the top should still be a little soft), grate over the cheese using the coarse side of a grater. 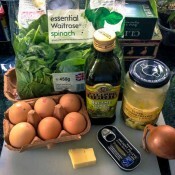 Sprinkle over the remaining ingredients: anchovies, sun-dried tomatoes, artichoke hearts and spinach or rocket leaves. Leave to cook for a minute, season with freshly ground black pepper (no salt is needed as the cheese and anchovies are already very salty) and the omelette is ready to be demolished! Best served with a mug of green tea.